Home from Pittsburgh where I was a speaker at the Art, Activism & Equity Symposium. The event was fantastic & I met an amazing amount of mind-blowing women. It was such an honor to be on the same bill as the Guerrilla Girls ! My talk was titled "Crafting Your Life: Craftivism & Creating Community". I spoke about my many projects and then showed a bunch of slides of craft+activism from around the world. Here I am with Jennifer Baron who was responsible for bringing me to the event. What an amazing weekend! More pictures are HERE & more information on the event is HERE. Just found this flyer! Two days till Pittsburgh! The New Hazlett Theater, Greater Pittsburgh Arts Council and the Women and Girls Foundation present a dynamic symposium, Art, Activism & Equity, as part of the "Women in the Arts" Festival on April 18 and 19, 2008. The festival celebrates the accomplishments of women in the arts in Pittsburgh and connects the local arts community with national resources, trends, and philosophies. The symposium in April will explore solutions regarding Southwest Pennsylvania's embarrassing record of women's compensation rates, build networks among Pittsburgh's emerging and established arts leaders while celebrating our region's unique strengths as a center for individual accomplishment. The program will also explore politics and feminism and will encourage local action, connection to resources and coalition building. The quest for equality is still critical. Conversation will explore today's feminist movement in the arts, in politics, in business and across generations. The main lobby will feature resource booths with information for artists and audience members to secure funding, get involved locally and globally, and spur their own projects. Melissa Swauger, of the University of Pittsburgh's Sociology Department, will present the Implicit Association Test, demonstrating that we all have subconscious discriminations whether we know it or not. In the United States, women earn an average of 76 cents to each dollar earned by their male counterparts. In Pennsylvania, the ratio is 73 cents to the dollar. In SW PA, the ratio is 69 cents. This discussion session will investigate the origins of those statistics and solutions and action steps locally and nationally. If your organization has a group of five or more, they can take advantage of the 10% discounted group rate. All registrations must be made at the same time. Heather Arnet serves as the chief spokesperson, fundraiser, and advocate for the organization. Since joining the Foundation as its first Executive Director, she has spearheaded Women and Girl's Foundation's efforts to pursue legislation at the city, county, and state levels for fair representation for women on Pennsylvania's appointed boards, authorities, and commissions. In 2004, Arnet was selected as one of Pittsburgh's "Top 40 under 40" by Pittsburgh Magazine. In 2003 she was honored with an award in "Art and Activism" from the Thomas Merton Center for Social Justice, and in 2005 AAUW awarded Heather a "Friend of Equity Award" for her work in fighting for women's rights. Slam poet and visual artist, Vanessa German, has shown and performed throughout the country. A featured performer at the International Arts Festival in Grahmstown, South Africa, Vanessa's performance poetry could be seen and heard in Germany, Sweden, Los Angeles, Chicago, Miami, Olympia, and New Mexico. Vanessa was a 2005 and 2006 nominee for Emerging Artist of the Year at the Pittsburgh Center for the Arts. She is the National Slam Bush Champion, Ink Tank Slam Champion, and was voted Best Spoken-word Poet by the Pittsburgh City Paper. In their own words … Who are the Guerrilla Girls? Faythe Levine is an artist and organizer based out of Milwaukee, WI. 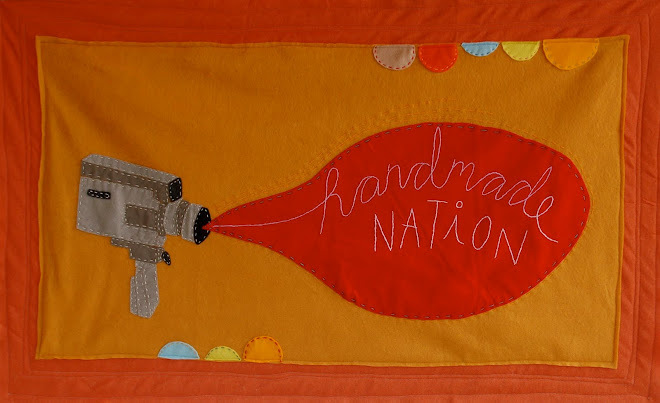 She is currently working on her first documentary film Handmade Nation: The Rise of DIY Art, Craft and Design which is due to premier in 2009. She is the co-author of a book under the same title published by Princeton Architectural Press that will be released in November 2008. Faythe is the founder and coordinator of Art vs. Craft, co-owner of brick and mortar space Paper Boat Boutique & Gallery and does freelance curating and design work. She also plays the musical saw in the experimental musical group Wooden Robot. Her work has been reviewed in The New York Times, Utne Reader, Venus Magazine, Paper Magazine, and American Craft Magazine. Growing up in Seattle during the 1990's gave Levine firsthand exposure to many punk bands and the riot grrrl scene. This underground community quickly exposed her to DIY ethics, and she learned early on that you could release, self-publish and distribute your music and zines through a vast nationwide network of like-minded people. In 2003, she found herself looking at an emerging movement that embraced both art and community, which can now loosely be defined as "the new wave of craft." This movement is exploring the uncertainty of where fine art meets craft, redefining and reclaiming creativity. The new wave of craft is influenced by the history and techniques of traditional handiwork, modern aesthetics, politics, feminism and art. Christiane D's lyrics tell unconventional stories in traditionally prose or poetic ways – more extreme that the folk ballads of Johnny Cash or Bob Dylan. Leach's stories are like movies, with scenes set and emotions conveyed through the eyes of the characters, rather than recounting the exploits of "Frankie and Johnny". At times, these songs can push the envelope of music, such as on "Next Victim", a disturbing, percussion-laden track on Peepshow that stretches the border between song and prose.-Justin Hopper – City Paper. Elizabeth Perry is a writer and new media artist. Her sketchbook journal may be found at www.elizabethperry.com/woolgathering, where she has been blogging since 2002. She is a fellow at the STUDIO for Creative Inquiry at Carnegie Mellon University and a founding editor of the award-winning Pittsburgh Signs Project, an online public art project documenting the visual landscape of western Pennsylvania (www.pittsburghsigns.org). Perry works at The Ellis School, an all-girls independent school in Pittsburgh,where she helps teachers integrate technology into a PK-12 curriculum. She has spoken and taught workshops about blogging and other new technology for artists both locally at venues like the Mattress Factory Museum and the Technology and the Arts conference at Carnegie Mellon University, and nationally at conferences like BlogHer (San Jose, 2006; Chicago, 2007) and She's Geeky (Mountain View, CA, 2007). The 24-year-old Pittsburgh native's most recent disc, "This Arduous Alchemy," is a collection of fetching come-ons and bittersweet yearning — or, in her own words, a "breakup and recovery album" — draped against a pastoral background of tuneful folk strains and rootsy meanderings infused with a jazz swing. To register for the symposium or for more information, please call the New Hazlett Theater at 412-320-4610, ext. 17 or email dsciranka@aol.com. 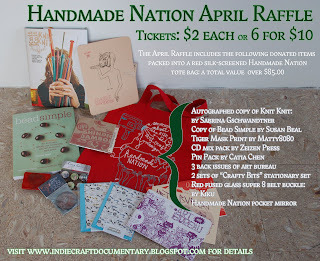 April Raffle tickets are now available! All proceeds of the raffle tickets go towards production cost (paying our editor, keeping credit card payments made, etc). To purchase tickets use paypal buttons on the right side of the blog! Tickets are either $2.00 each or 6 for $10.00, winner will be announced at the end of April- good luck! And, as always, thank you so much for your continual support! Last night I got a quickie tutorial of how to make plastic flowers out of plastic bags- I can't remember the fantastic lady's name who showed me, but she was super nice to show me. She even uses zip ties so you can leave them around the city zipped to poles and fences! Flower for all. I am currently sitting in the Minneapolis airport waiting for my connection flight to San Francisco, I'm on my way to the 2008 Craft Congress! Not only am I excited to see all of my friends and colleges from around the country including Betsy Greer, Garth Johnson and Sue Daly to name a few out of towners, but I also get to hook up with some local peeps like Stephanie Syjuco and meet my editor Clare Jacobson from our publisher Princeton Architectural Press for the first time. I also get to check out some fantastic gallery shows while in town. On my list are Monica Canilao and Swoon's installation at the Luggage Store Gallery, the Hope Springs Eternal opening at Needles and Pens, and my first visit to Rare Device! This will all be crammed into the next 3.5 days I'll post pictures and updates tomorrow.